It is free and takes 2 minutes! No one else provides this level of Governor support for free. Better understand your responsibilities as a Governor with timely email briefings on statutory changes as they break based on our real-life experience of supporting 6,000 Governors at over 700 schools. Better prepare for your next meeting with access to our extensive archive of webinars, briefings and insight. It is easy to collaborate with your Governor colleagues using Better Governor to share and alert them about timely and relevant insight. This makes clerking easier. Receive invites to networking events to learn from and network with other school governors. 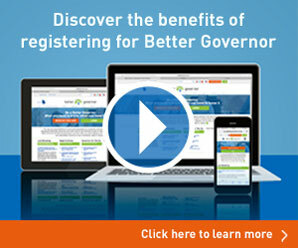 Access articles on the Better Governor app - be a Better Governor on the go! Tell us a little more about your school. School post code FIND SCHOOLDon't know your school's postcode? Are you signing up to a corporate subscription? We want to know more about the challenges you’re facing. We’ll make sure we share information that is relevant, and tailor the site to help you find appropriate information easily. I’d like to receive news, topic alerts, and information specifically selected, that is relevant to school governance. That’s it! You are ready to go.